Many beaches still don't have enough informative signs that can clarify where you can swim with a dog without letting other people stare at you and wishing you to leave. There are many online guides and locations that still need to be updated, to be more complete and able to serve as a reliable source of information. When we talk about the Adriatic coast it is well known that on the beaches marked with blue flag access to dogs is not allowed. During your vacation it is assumed that you do not want anything less than an idyllic atmosphere but frequent restraints and also searching for places suitable for pets can cause additional headaches, so before you go on travel you really need to make a decision to take a dog with you or not. In search of pet regulated and convenient places, before travel it is necessary to pay attention to things like the way of transportation, crossing the border if you travel to another country, gathering the necessary equipment, and visiting the vet. Also if you want to go to the beach accompanied by your pet you have to take a lot of things into consideration. Again, you should be well informed and have everything planned out. It is often that dogs do not respond well when they stay on the beach so they can possibly do something unexpected a react to many things. It is, therefore, necessary to assess whether the beach is an ideal environment for your dog. There is also a local population that can react negatively to the presence of pets, especially if you do not respect the clearly defined rules. Although the rules may not be very ideal for you, they must be respected. The last thing you want is some inconvenience. If you have determined that behavior and unexpected dog reactions will not be a problem, it is necessary to do something to protect the dog while staying on the beach. First of all, you should consider staying in the shade because excessive exposure to sunlight can be very damaging. Since summer temperatures are high it is also necessary to bring enough water supply to avoid dehydration. Increased awareness of the need for a "pet-friendly" locations has enabled the developing the new stuff that should facilitate holidaying for tourists and their pets. In addition to clearly designated places for swimming with pets, you can find many garbage cans, showers, and water supply places. Some beaches things have gone a step further because there are many bars that offer specialized dog menus and drinks. Croatian beaches, besides being among the best in the world, are always trying to offer their visitors something more than just a beautiful sight, so it is not surprising that every year there is a new interesting element to find. In this case, we are talking about improved conditions of the beaches for tourists and their dogs. 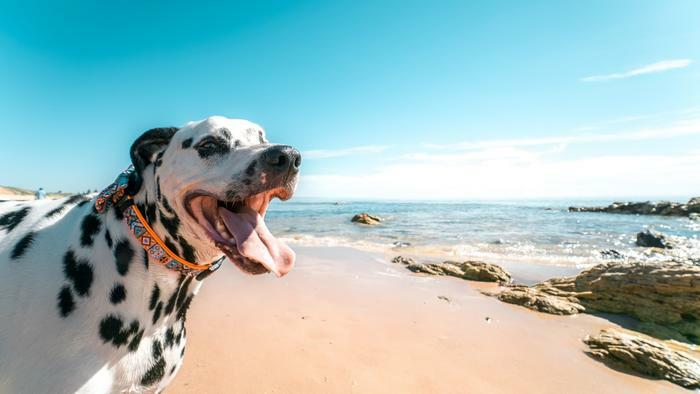 The largest number of such beaches can be found in Istria and Kvarner, and more dog-friendly beaches are being regulated in the areas of northern, central and southern Dalmatia. To help you narrow down the search for places for you and your dog, we bring you a detailed list of the 5 best beaches lined by regions on the Adriatic coast from north to the southern part. The Podvorska beach is one of the best beaches in Crikvenica, in Primorsko-goranska County. In addition to being a perfect spot for families, this pebble beach is known throughout the world as one of the best for dogs. You can access the beach very easy, with a private car for which there is a parking space or you can walk down there. It's close to all amenities so you do not have to worry about carrying too much stuff on the beach. You found your ideal dog-friendly beach where you can enjoy with your pet? Do not miss out on our accommodation offer in Crikvenica. One of the newly refurbished beaches with all the necessary pet equipment is located in Peroj, a small Istrian town. It is a pebble beach called Portić. The beach is equipped with showers that have small extensions for your pets, and besides the shower, you can also use the extension for drinking water. Protecting from sun exposure is important, so you might look for small shade booths where the dog can rest and stay away from the sun. The beach also has a 2,5 km long promenade leading all the way to Fažana, and it is worth mentioning that the beach also has many bars and restaruants. Does Istria look to you like a great destination for spending a holiday with pets? Check out the accommodation offer for Istria. If you are more of a type who would like to spend summer on the island don't worry. There you can find a place under the sun and a beach adapted for pets too. One of the islands that provide all you need is the Vis and its town Komiža. It has an amazing nature so you will not have to worry about the activities for your dog because besides swimming you will be able to take long walks, and because of the fact that the beach is close to the water source you won't have to carry large water supplies. Want to spend summer with pets on the island of Vis? Look at the accommodation suitable for you and your pet. Recently, Split has got its own beach for dogs. The pebble beach Duilovo has most of the things necessary for pets and is suitable because there are no frequent crowds. The beach is about 40 m long, and there are no bars or shops nearby, so it would be good to take water with you before the arrival. On the beach, there are showers, water, designated places for waste disposal, changing rooms and small tents where it is possible to get away from the sun as the beach itself does not offer much natural shade. Are you looking to spend the summer in Split? Check out our offer and prepare yourself for this summer. In the town Slano near the Dubrovnik, there is also a pebble beach, which is ideal for enjoying the summer months with pets. The beach is accessible but there is no much restaurants, bars or stores so it is necessary to pack some things before coming to the beach. The place is not big but that does not mean that it will be crowded, on the contrary, you will be able to enjoy the peace and you will not have to think whether you will find the free spot. Considering the growing touristic offer, and the efforts to improve conditions for pets and their owners, travelers are now in a position where they don't have to choose between leaving a pet at home or taking him, but with the worry of not finding a dog-friendly place. You can take a hairy family member with you and enjoy the sun and the sea with no fear that someone will look you differently or ask you to leave because the dog is „noisy”. For a pleasant stay on the beach, you must not forget to look and respect the rules clearly indicated on every dog-friendly beach. Find your perfect spot and enjoy the beauty of Croatian beaches with your pet.